Fig. 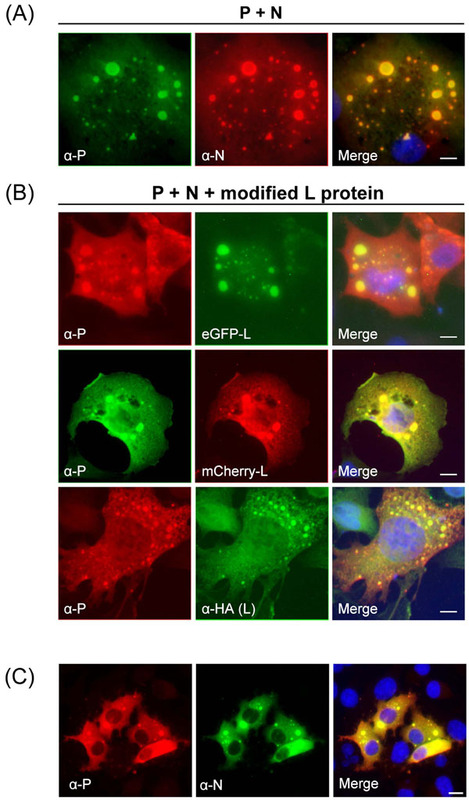 (2) HA-L, eGFP-L and mCherry-L co-localize with inclusion bodies formed by P and N in the absence of other viral proteins. Co-expression of P and N (A) or of HA-L, eGFP-L and mCherry-L together with P and N (B) in BSRT7/5 cells. (C) Hep-2 cells infected by HRSV (strain Long) 24 h post infection. Cells were fixed 24 h post transfection (A, B) or post infection (C) and labeled with anti-P antibodies (green or red) together with either anti-N (red) or anti-HA (green) antibodies, and the distribution of viral proteins was observed by fluorescence microscopy. eGFP and mCherry were visualized by virtue of their own fluorescence. The yellow color present on computergenerated merges denotes co-localization. Nuclei are in blue ( stained with Hoechst 33342). Scale bars, 10µm.